Clicking the link at the top of this page will automatically begin the installation process of Orthoviewer. Monitor the progress of the download at the bottom of your screen! It takes a minute or so. Some systems require you to push “Run” while others will start automatically. 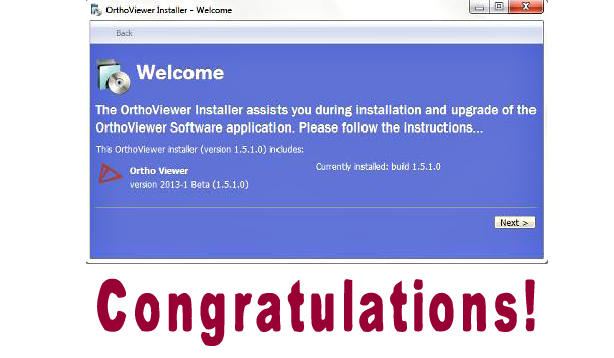 Once you click the Download button, the OrthoViewer Installer will open up and help walk you through the installation process.Click “Next”. Select all available extension options, then click “Next”. Once you see the following screen with green check marks next to both “OrthoViewer” and “Updating shortcuts”, click “Finish” and you have successfully completed the install of Orthoviewer. When the installation has been complete, the ‘3Shape OrthoViewer’ icon will appear on your desktop. The program will also appear in the windows program list.